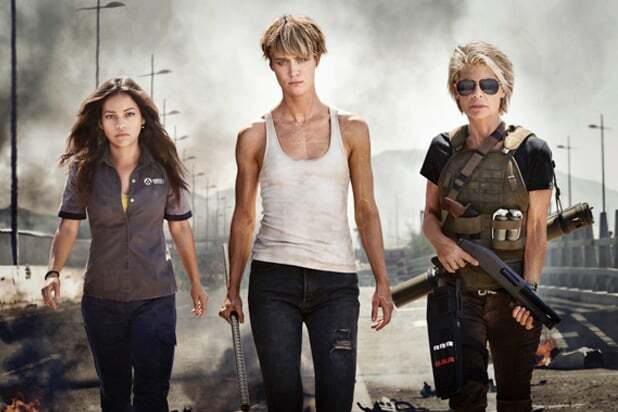 Paramount has released the first official image of the upcoming “Terminator” sequel, in which Linda Hamilton returns as Sarah Connor. In the image, we also see Mackenzie Davis and Natalia Reyes, who will star as Grace and Dani Ramos, respectively. Hamilton looks like a badass holding a gun and wearing a vest, but her usual long locks are replaced by a shorter haircut this time around. “Deadpool” director Tim Miller will shoot the film with series creator James Cameron returning to the franchise for the first time since “Terminator 2: Judgment Day” as a producer. Schwarzenegger, Gabriel Luna and Diego Boneta also star. The “Terminator” reboot is the sixth film in the long-running sci-fi series, with Skydance producing and Paramount distributing. The last film in the franchise, “Genisys,” grossed $89.8 million at the box office. The highest-grossing film in the franchise was “T2,” which earned $204.8 million. The next “Terminator” will be released on Nov. 22, 2019.